Recently I opened up our deep freezer and saw numerous bright orange bags of pumpkin puree staring at me. :) As you might know, my husband recently wrote a post on some uses for pumpkin and how he got 40 cups of puree from 10 pie pumpkins! Needless to say, we are well-stocked and I need to make good use of it. Since we are in the midst of winter, I know it's important to incorporate pumpkin into our diet in order to help naturally boost our immune system. Typically, I love to make some amazing pumpkin bread for a healthy snack or breakfast treat. Unfortunately, my kefir grains have been acting up when using it with our raw milk (still troubleshooting that) so I didn't have any kefir available to use for my bread recipe. I thought it would be a good opportunity to try something new anyways. I found this recipe in my Grandma's old Better Homes and Gardens New Cook Book (it is definitely not new anymore...). In a mixing bowl, combine flour, sugar, baking powder, salt, other seasonings and chocolate chips. Make a well in the center. Combine egg, milk, oil and pumpkin puree. Add the liquid mixture all at once to the flour mixture and stir just until moistened. Pour batter into lightly greased muffin cups (2/3 full) and bake at 400 for about 20 minutes. Yield: 12 muffins. Pumpkin really is one of God's wonderful gifts to us! 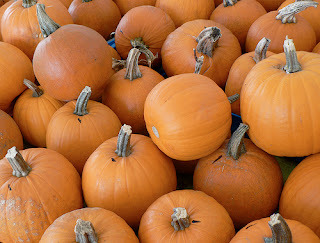 Even if you don't have your own pumpkin puree, try to pick up some this winter. Maybe next fall you can try your hand at pureeing your own pumpkins. I think you'll be glad you did! Well now I feel extra good about the yummy breakfast we just ate. On a whim, I decided to add 1/2 C. pumpkin to the oatmeal I was cooking on the stove. Added 2 T. brown sugar, 1 tsp cinnamon, 1/4 tsp nutmeg, and 1/4 C. wheat germ. It was awesome and all three of my kids gobbled it up! And I have some pumpkin left over so it looks like these yummy muffins are in order! Thanks! Just out of curiosity- why only organic canola oil? Did you make a post about this preference? ps. that sounds like a great idea with the pumpkin and oatmeal! i'll have to try that. Thanks!!! We're mainly using olive and coconut oil and ghee now. We still use canola because we have a bunch left but that's for the bread for communion at church. Thanks for posting this recipe! I made these today with some leftover butternut squash puree. I like how they have a nice fluffy texture but are not too sweet.